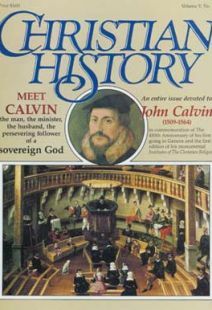 DURING HIS LIFETIME, Calvin was already recognized as a major figure in Europe. His life, thought and work came to influence church structure and practice, international affairs, political realignments, and the definition of orthodoxy. Below is a chronology of significant dates and events in Calvin’s life. 1509 Calvin was born in Noyon, France on July 10. 1523 Fourteen-year-old Calvin goes to Paris to study. 1528–29 Calvin goes to Orleans and then Bourges to study law. 1532 He publishes his first work—a commentary on Seneca’s De Clementia. 1534 Calvin visits Lefevre D’Etaples and resigns his two benefices. 1536 In March, first edition of his Institutes of the Christian Religion is published. 1536 In August, Calvin is persuaded by Farel to remain in Geneva. 1538 Calvin and Farel are banished from Geneva. Calvin goes to Strasbourg as pastor to the French-speaking congregation. 1539 Cardinal Sadeleto writes letter to Geneva. Calvin is asked to respond on behalf of Geneva. 1540 Calvin’s Commentary on Romans is published. In August, Calvin marries the widow of an Anabaptist, Idelette de Bure. 1541 Calvin is welcomed back to Geneva September 13. 1542 Calvin writes a treatise on free will against the Roman Catholic theologian Albert Pighius. 1549 Calvin’s wife, Idelette, dies. Consensus Tigurinus is signed with Zurich. 1552 Jerome Bolsec banished from Geneva. 1553 Servetus is burned at the stake for heresy. 1559 Calvin is made a citizen of Geneva. Final edition of Institutes is published. Academy is established. The meaning of the mnenomic device TULIP.